Lenten stew with spinach, chickpeas and fish dumplings. I got that posting about chorizo up just in the nick of time, while Carnival was in full swing, celebrating Don Carnal, all the things of the flesh. Now it’s Lent, the season of abstinence. In Spain, observant Catholics abstain from meat on Fridays during Cuaresma, Lent, the weeks leading up to Easter. 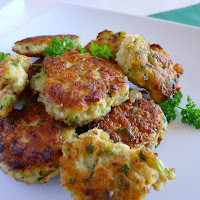 So there is a rich tradition of fish and vegetarian recipes for this season. Before refrigeration and automotive transport, inland regions of the country didn’t have access to fresh seafood. 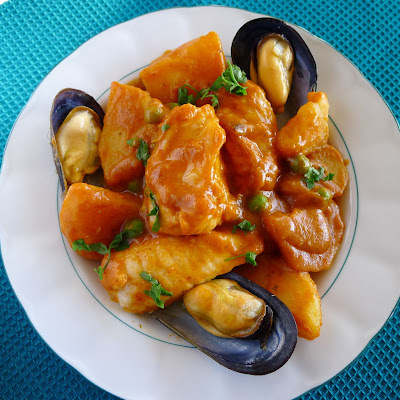 Bacalao, dry salt cod, became the mainstay for Friday meals during Lent. 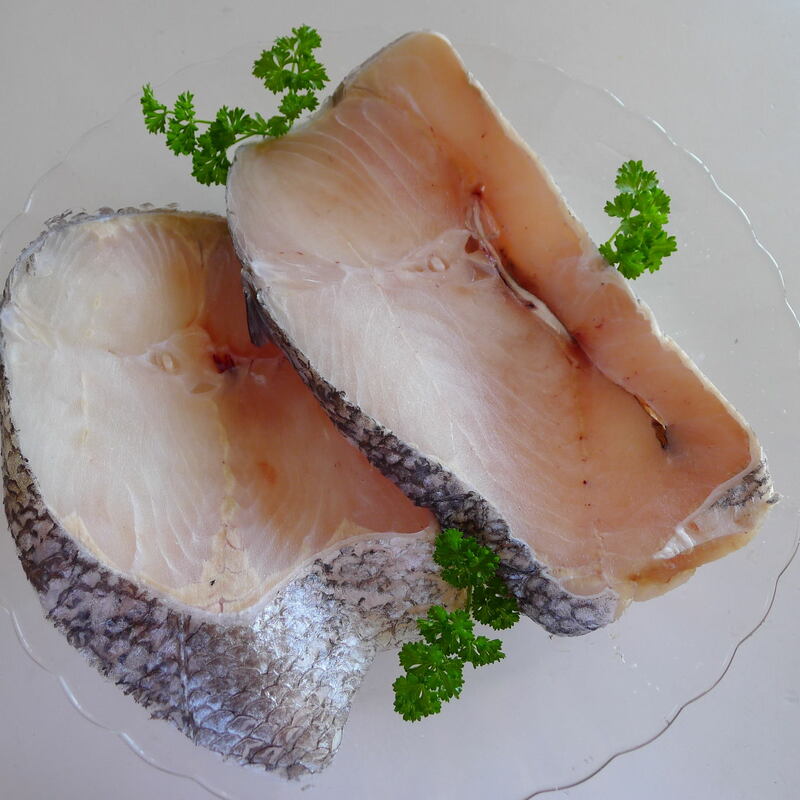 And, although many are aficionados of salt cod, nowadays frozen fish is a viable alternative. No lengthy soaking to de-salt the cod. 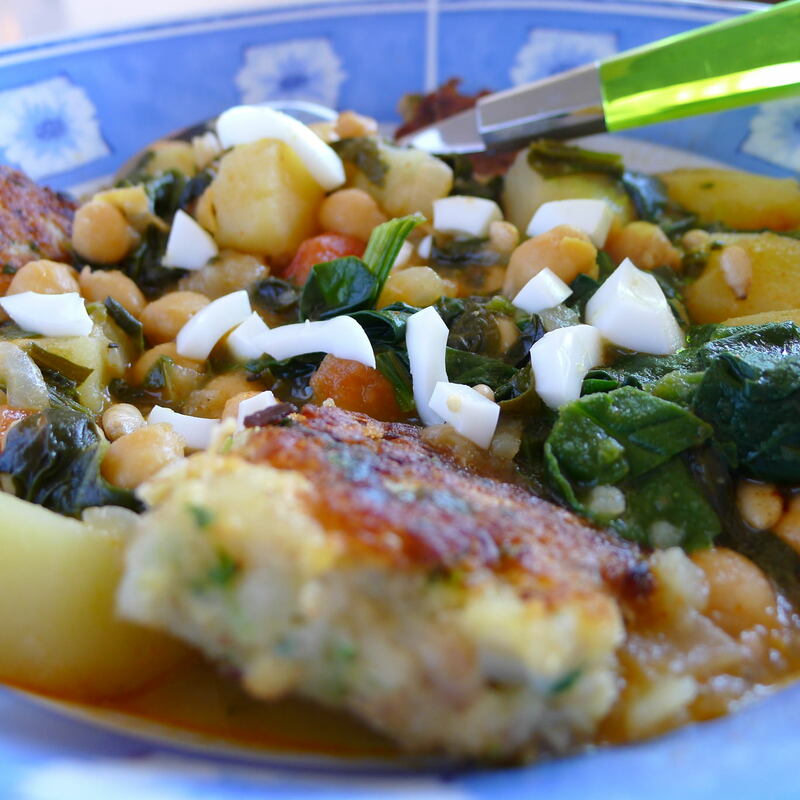 I have adapted some traditional recipes, such as this potaje, or pottage, of chickpeas, spinach and potatoes with cod dumplings. 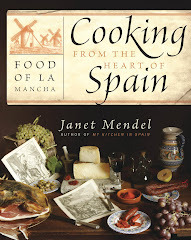 The dish comes from La Mancha and the dumplings, called rellenos or “stuffings,” are little fish patties that are first fried, then simmered in the stew. 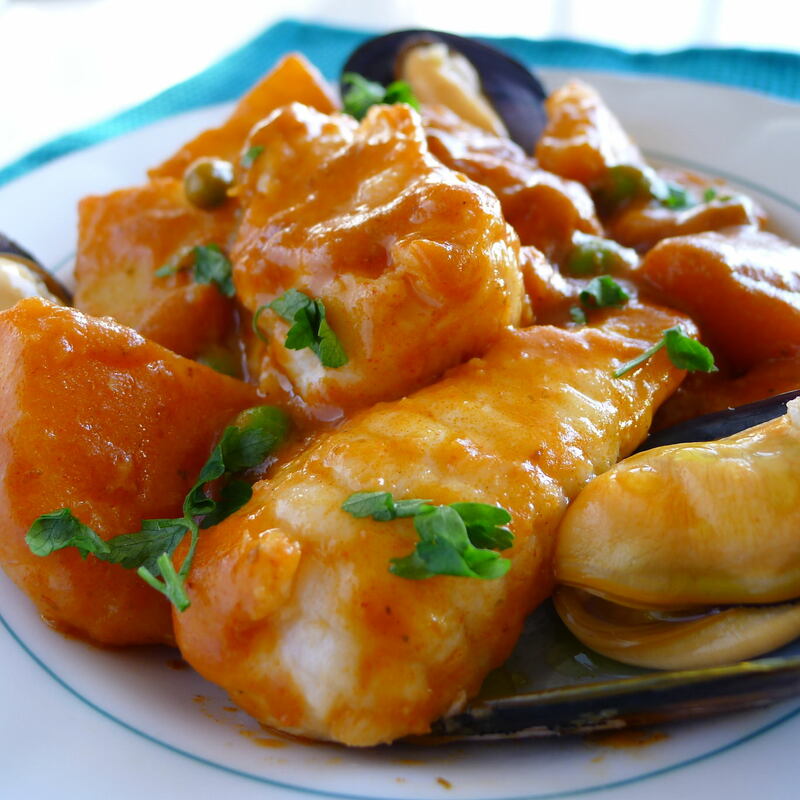 You certainly don’t have to be abstemious to enjoy this very tasty vegetable and fish dish. You could use fresh or frozen cod or any white fish. I used frozen merluza, hake. Rellenos—dumplings—are typical of the province of Cuenca. A sweet version of rellenos—without the cod, of course—is poached in milk and dusted with cinnamon and sugar. Fish "dumplings," ready to add to soup. Chop the fish coarsely and reserve. Mince the scallions and parsley in a food processor. Add the bread crumbs and cod and process until minced. Add the egg, pepper, salt and cloves. If needed, add a spoonful of water to make a paste that holds together. Heat the oil in a heavy skillet. With hands or two tablespoons, lightly shape cod mixture into small (1 ½ inch) patties. Fry them until golden on both sides, about 6 minutes. Set aside until the chickpeas and spinach are cooked. Put the chickpeas in a soup pot and cover with water (about 7 cups). Bring to a boil and skim off the froth that rises to the surface. Add the bay leaves. Cover and simmer 30 minutes. Add the salt to the chickpeas and cook until chickpeas are tender, about 60 minutes more. Drain the chickpeas, saving the cooking liquid. 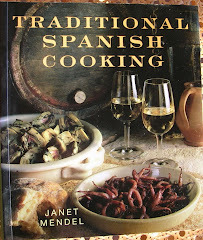 Heat the oil in a cazuela or deep skillet and sauté the onion for 5 minutes. Remove the skillet from the heat and stir in the pimentón and cayenne. Add the tomato and continue sauteing for 3 minutes. Add the chickpeas to the cazuela along with 2 cups of the reserved cooking liquid. Add the spinach and potatoes. Bring to a boil, cover and simmer until potatoes are tender, about 20 minutes. Mash the egg yolk with the garlic. Dilute with some of the liquid from the chickpeas and stir in to the chickpeas. Add the fried cod dumplings to the chickpeas and cook gently 5 minutes until they are thoroughly heated. 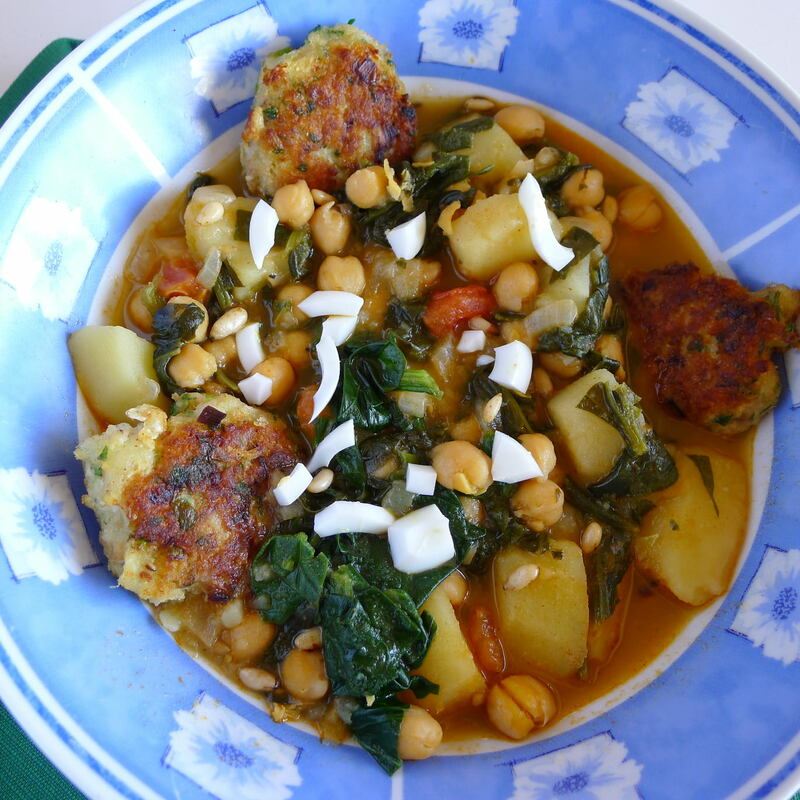 Serve the chickpeas, spinach and dumplings in deep soup bowls. Chop the egg white finely and scatter over the chickpeas with a few pine nuts. Pimentón is an ingredient that pops up over and over in Spanish recipes. (See last week’s post about chorizo.) Pimentón is, simply, Spanish for “paprika”. So why don’t I just call it paprika? Because the Spanish word is so much closer to the origin of this spice than is paprika—a word of Serbian origin. Here’s the pimentón creation story. Pimentón is produced from the capsicum annuum pepper, the chile, discovered by Columbus on his first trip to the New World. 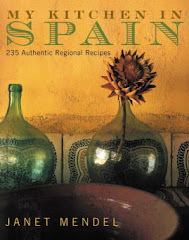 He was looking for the “Indies,” the source of “pepper,” pimienta in Spanish. When he found the hot-tasting capsicum, Columbus called it pimiento, from which derives “pimentón”. Columbus carried peppers and other New World fruits back to Spain, where they were cultivated by monks in various abbeys. The Hieronymite monks at the Yuste monastery in La Vera (Extremadura) were the first to dry the peppers and use the powder as a flavoring and food preservative. They shared with brother-monks at the monastery in La Ñora (Murcia). Supposedly Emperor Charles V, when he abdicated the Spanish throne in 1555 and retired to the Yuste monastery, got to like the spice (he was a notorious gourmand) and recommended it to his sister, Queen Mary of Hungary (which roped in parts of Serbia). That’s where it became known as “paprika,” the Serbo-Croatian word for “pepper”. Pimentón is made from choricero peppers (left) and ñoras. So, how is it produced? Pimentón is made from dried red peppers which, depending on the cultivar, can be sweet, bittersweet or hot (picante). After drying, the peppers are milled—ground—to a fine powder. The most used peppers are the choricero, elongated, and the ñora or bola, a sort of mini bell pepper, about the size of a plum. Both are sweet to bittersweet. Pimentón is produced both in Murcia, in eastern Spain, and in the La Vera region of Extremadura in western Spain. In Murcia, in eastern Spain, the hot, dry Mediterranean climate allows the peppers to be sun-dried (or, industrially, dried with hot air). In autumn when the peppers ripen in La Vera, early rains in the Atlantic climate of Extremadura make sun-drying impossible. So, the peppers are smoke-dried 10 to15 days over smouldering chunks of wild holm oak. From the smoking sheds they’re carried to the milling factory where they are stone-ground to red powder. The slow smoking fixes the natural carotenoid pigments of the peppers, producing an intensely red spice. It also adds an ineffable natural smokiness that complements many foods. So, pimentón de la Vera (which has DO, denominación de origen) is smoked paprika. Pimentón de Murcia (which has DOP, denominación de origen protegida) is not smoked. They are both “pimentón.” Both come as dulce, sweet; agridulce, bittersweet, and picante, spicy-hot. Dulce—sweet pimentón—is, by far, the most widely used spice in Spanish cooking. 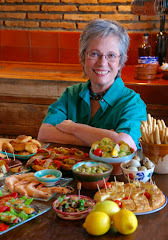 Sweet pimentón, smoked or unsmoked, is the most versatile, while the bittersweet adds complexity to a dish. The spicy-hot is piquant and flavorful, but not as fiery as cayenne. In Spain, the lion’s share of pimentón goes to the sausage-making industry. 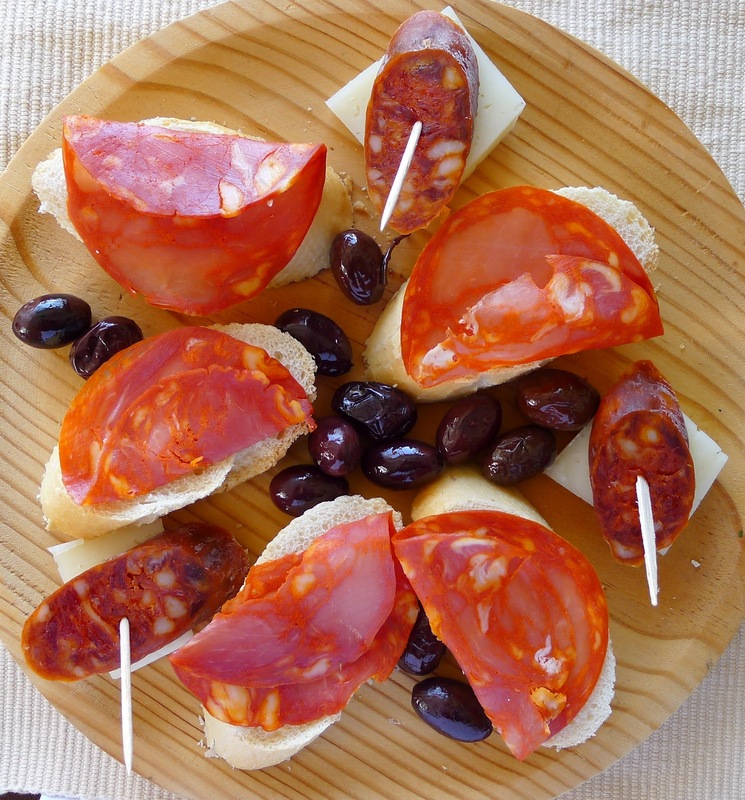 The most emblematic Spanish sausage, garlicky chorizo, is colored and flavored with it. 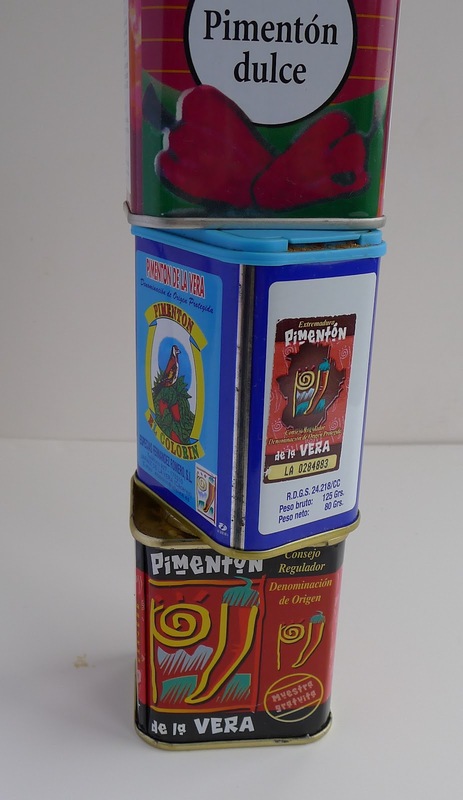 Pimentón is widely used in home cooking too and not just a sprinkle for color. Heaping tablespoons of it go into sauces where it provides richness of flavour. In Extremadura, La Vera pimentón is the preferred type. Elsewhere in Spain, unsmoked pimentón is used lavishly, even in paella and other rice dishes. Use Spanish pimentón, smoked or unsmoked, in any recipe calling for paprika. It gives a little flamenco flounce to Hungarian goulash. Use the La Vera spice, with its earthy, smoky aroma, in barbecue sauces, marinades and spice rubs. 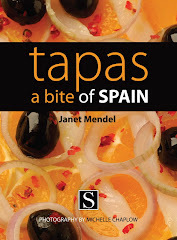 The spicy-hot version adds pizzazz to beans and lentils, gratin dishes, seafood cocktail sauces. The hot stuff is a wake-up call for humble devilled eggs or potato salad. Scrape pulp from choricero peppers. In cooking with pimentón, stir it into a little water and blend smooth before adding to a sauce. Or stir it into hot oil—off the heat—before incorporating liquid ingredients. Take care not to scorch pimentón, else it becomes bitter. If using pimentón on barbecued food, add it during the last few minutes of grilling, so that it doesn’t burn. Store pimentón tightly covered and protected from light. To use dried choricero or ñora peppers instead of pimentón, remove stems and seeds from the peppers, then soak them in boiling water until softened. Open the peppers and scrape the pulp from the inside. This can be made with any solid-fleshed fish, such as monkfish or skate. The sour juice of bitter oranges gives punch to the sauce. Cut the fish fillets into 3-inch pieces. Sprinkle with salt and let set for 30 minutes, then pat the fish dry. Soak the bread in water to cover until softened. Squeeze it out and put in a blender with the garlic, pimentón, oregano and wine. Blend until smooth. 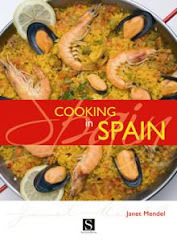 Heat the oil in a cazuela or skillet. Sauté the pieces of fish about 1 minute on each side. The fish does not need to brown. Remove. Add the potatoes to the cazuela and turn them in the oil for 3 minutes. Pour over the blended pimentón sauce. Add the fish stock or water. Simmer until the potatoes are almost tender, 20 minutes. Add the fish to the pan and cook in the sauce for 10 minutes, or until fish flakes easily. If sauce thickens too much, add additional broth or water. Add the vinegar or orange juice and cook 2 minutes more. Garnish with the steamed mussels. Sprinkle with chopped parsley and serve in the same cazuela in which the fish cooked. In all the years I have lived in southern Spain, I recall only twice ever that the temperature dropped below freezing. Once, many years ago, I awoke to find icicles hanging from a drippy tap in the garden. Another time, the dog’s water bowl was frozen over. On another occasion, although it wasn't so icy cold, we awoke to find the ground covered in snow! The kids raced to ski down the steep driveway before it melted off. So when the TV weather woman predicted a hard freeze for my region, I prepared. Dry firewood ready (prunings from the olive trees). Gloves and scarves located. And a big pot of lentils on the stove. Today is, indeed, mighty cold. But the temperature did not dip below freezing. The sun is shining and I’m going to curl up by the fire and enjoy a bowl of heartwarming, stick-to-the-ribs lentils. The most common variety of lentil in Spain is the rubia castellana, big, flat disks of a pale greenish-brown color. They cook up ever so soft, without turning to mush. The tiny, dark brown pardina lentils, which always stay al dente, can be substituted. Castilla-La Mancha grows 90 percent of the lentils produced in Spain, but, as this is insufficient to meet demand, much is imported. At my local store in southern Spain, the castellana lentils come from Canada! Lentils don’t need soaking overnight, as do most legumes. Be sure to use soft water (bottled or filtered, if your water is naturally hard), for cooking. This helps the legume to soften. Lentils with chorizo and vegetables. Pork belly, consisting of ribbons of lean and fat, is pancetta or bacon before it is salted and cured. Any fatty bits of fresh pork could be used, including spare ribs cut into short lengths. Fresh pork-link sausage can be substituted for the chorizo. Add additional pimentón, if not using chorizo. Wash and drain the lentils. 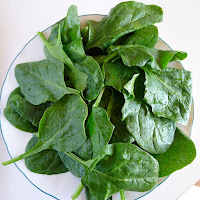 Place them in a cazuela or soup pot and add 6 cups of fresh water. Cut the pork belly into ½-inch strips. Slice the chorizo crosswise. Heat the oil in a small skillet and fry the pork and chorizo on medium heat until lightly browned. Tip the skillet to drain the fat to one side and skim the pork and chorizo out and add to the lentils. Discard the fat. Stick the cloves into the onion and tuck it into the lentils with the head of garlic, carrots, green pepper, tomato, bay leaf, salt and pepper. Stir the pimentón into 1 tablespoon of water until smooth, then stir into the lentils. Add the red pepper flakes, if using. Bring to a boil, lower heat to a simmer and cover the lentils. Cook gently for 30 minutes. Add the potatoes and cook 30 minutes more or until lentils are tender. Remove and discard the onion and bay leaf. Remove the tomato, cut out the core and discard skin. Use the edge of a spoon to break the tomato into pieces and return them to the lentils. If desired, the soft-cooked garlic cloves can be separated and mashed into the lentils. Let the pottage sit, covered, 15 minutes before serving. Each person adds pickled onions and peppers to taste.